Niobium (Nb) (atomic number 41 and atomic weight 92.91) has density of 8.57 gm/cc. The element is also known as Columbium (Cb). Melting point of Nb is 2467 deg C and boiling point is 4740 deg C.
Cb was discovered in 1801 by Charles Hatchett, who named the element to signify the American origin. This name was used in USA while Europe used the name niobium for the same element. To end this confusion, the name niobium was chosen for element 41 at the 15th Conference of the Union of Chemistry in Amsterdam in 1949. A year later this name was officially adopted by the International Union of Pure and Applied Chemistry (IUPAC) after 100 years of controversy, despite the chronological precedence of the name Columbium. Columbium name is still used in many places in USA. The phase diagram of the Fe-Nb binary system is at Fig 1. The use of Nb dates back to 1925 when it was used to replace tungsten (W) in tool steel production. By the 1930s, Nb was being used to prevent corrosion in stainless steels. The ability of Nb to maintain fine grain sizes in steels at higher temperatures has been known since 1940s and steels that take advantage of this effect have been commercially produced for many years. In recent years, however, Nb is being known more as one of the most important element for the micro alloying. Nb plays an important role in HSLA (high strength low alloy) steels. Nb also has important applications in tool steels, wear and abrasion resistant steels, steels for high temperature service, stainless steels and super alloys. Many of these uses depend on the strong affinity of Nb for carbon (C) and/or nitrogen (N). Nb is available in ferro alloy form. Standard grade of ferro- niobium (Fe-Nb) contains around 60 % Nb. Fe-Nb can also contain 3.5 % maximum of aluminum (Al), 3.0 % maximum of silicon (Si), and 2.0 % maximum of titanium (Ti). C content is held to 0.30 % while its tantalum (Ta) content is less than 0.50 %. High purity Fe- Nb contains 62-68 % minimum Nb, 1.0 % maximum of Al, 0.2 % maximum of Si, and 0.1 % maximum of C and 0.30 % maximum Ta. Fe -Nb is added to the steel teeming ladle after the additions of silicon and/or aluminum and either along with or just after manganese. Addition of Fe-Nb is to begin when the ladle is about one quarter full and to complete the addition before the ladle is half full. Ferro- Nb has a fairly high melting range of 1400 deg C to1580 deg C and hence making the addition early in the tap helps ensuring its complete dissolution with adequate dispersion. This also improves recovery. 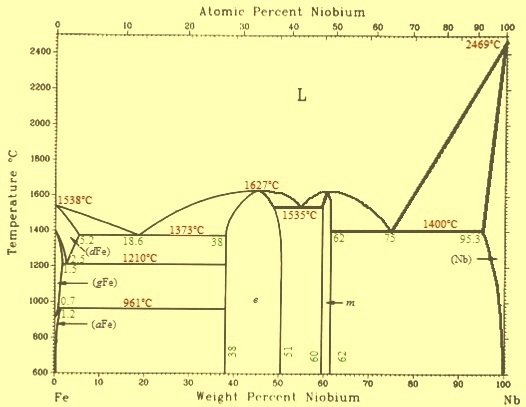 Fe- Nb has a chill effect which results in decrease in bath temperature of 0.7 deg C/kg/ton at 1600 deg C.
Nb is not an exceptionally strong deoxidizer and alloy recoveries are normally quite high, although recovery of Nb when remelting scrap in an oxidizing atmosphere is only in the range of 10% to 20 %. Recoveries in fully killed steels are minimum 80 % and can easily exceed 90 % if conditions are carefully controlled. Although it is a grain refiner, Nb does not (unlike Al) lead to nozzle blockages during the continuous casting. Nb produces significant strengthening in rolled steels through the precipitation of a hard and stable carbide, nitride or carbonitride [NbC(N)]. The carbide forming tendency of Nb is stronger than that of vanadium (V) while as a nitride former, Nb is weaker than titanium (Ti). The carbonitrides of Nb are stable at the lower ranges of the rolling temperatures. The existence of carbonitrides at these rolling temperatures, and their ability to precipitate throughout the hot rolling process, is the basis for controlled thermo- mechanical rolling of steels. The object of thermo-mechanical rolling is to produce extremely fine grain sizes in the rolled steels so that these steels can have the desired properties. Hot rolling of steels alloyed with Nb starts on a finer existing grain structure. As hot rolling proceeds, the continuing precipitation of NbC(N) retards the growth of deformed and recrystallized austenite grains. These austenite grains result into extremely fine grained ferrite – pearlite or acicular structures upon eventual transformation. During hot rolling of steels the beneficial effect of Nb starts while reheating of steel. Nb is partially in solid solution at this high temperature and partially as still precipitated fine carbonitrides. The residual precipitates help maintain a fine austenitic grain size before rolling. Steels which have high toughness requirements therefore must rely relatively more on grain refinement than precipitation strengthening to achieve their desired strength levels. These steels are to be reheated in the range of around 1095 deg C to 1150 deg C to take advantage of this effect. Steels which do not have stringent toughness requirements can take relatively greater advantage of precipitation strengthening. These steels are therefore reheated to somewhat higher temperatures to dissolve all Nb carbonitrides before rolling begins in order to maximize the potential for precipitation strengthening later on. In both the above cases some ultrafine precipitates of Nb carbonitrides forms during hot rolling, especially during the later stages of deformation. These particles strongly retard the recovery and recrystallization of austenite during hot deformation. Retarded austenite recrystallization leads to the formation of a fine pancake austenitic grain structure at the end of the hot deformation process. This structure in turn leads to an even finer ferrite/pearlite/bainite grain size after transformation. By retarding the austenite recrystallization temperature, Nb in effect raises the finish rolling temperature needed to produce the pancake grain structure necessary for high mechanical properties in the rolled steel. Accelerated cooling (AC) following controlled rolling has become an increasingly important technique for raising strength and toughness properties while maintaining low carbon equivalent values (CEV) for good weldability. Yield strengths on the order of 600 MPa are being achieved in the as-rolled and AC condition at a CEV < 0.35. Nb is particularly beneficial to AC steels since it promotes the formation of fine grained ferrite-bainite microstructures despite the fact that it also produces fine grained austenite. When present in appreciable quantities, Nb acts as a ferrite stabilizer, progressively closing the gamma loop. The main function of Nb in micro alloyed forging steels is to maintain a fine grain size. Fine grain size contributes to high toughness, an important consideration in safety-related applications such as steering- and suspension system components. Low to medium carbon Nb-V steels utilize a combination of grain size and precipitation hardening to achieve high strength levels. Low carbon Nb-Mo micro alloyed forging steels derive their mechanical properties from a fine-grained bainitic structure. Properties in these forging steels depend on cooling rate with optimum strength and toughness gained by quenching directly from the forging operation. In very large Nb-treated stainless steel ingots, NbC can segregate and cause a decrease in ductility in the centre of large forgings. Nb also depresses the g – d transformation temperature, which contributes to the formation of extremely fine acicular ferrite or bainite grains with high dislocation densities. Such microstructures result in steels with high strength and good notch toughness. Since C content in these steels can be quite low, weldability is normally very high in these high strength steels. The ferrite in micro alloyed steels can be further strengthened by precipitation of extremely small Nb carbonitride particles during transformation. Normalized as well as quenched and tempered steels utilize the grain growth inhibiting effect of Nb during normalizing or austenitizing. The finer grains that result from Nb additions increase strength and toughness at constant CEV levels, or permit constant strength and toughness levels to be maintained at lower CEV levels. Other benefits that are obtained from Nb additions include the development of favourable crystallographic textures and elimination of strain aging, with improved formability. This depends on the degree to which C and N (nitrogen) are combined as Nb carbonitrides. Sufficient removal of C and N from solid solution in ferrite results in the production of (interstitial-free) steels. In low C alloy steels, Nb lowers the transition temperature and aids in a fine grain structure. Nb retards tempering and can decrease the hardenability of steel because it forms very stable carbides. This can mean a reduction in the amount of C dissolved into the austenite during heat treating. Nb has a negative effect on martensite hardenability because of its strong ability to remove C from solution. Nb is therefore not a specified constituent of the heat treatable constructional alloy steels. Some grades of structural, pressure vessel or abrasion-resistant steels do contain Nb in combination with Mn (manganese), Mo (molybdenum), Ni (nickel), Cu (copper) and Cr (chromium). Direct quenching of micro alloyed Nb forging steels is commercially practiced at many places. A number of Nb bearing steels are roller quenched and tempered. One heat treatable, low C micro alloyed Nb forging steel requires controlled quenching after forging to produce an auto tempered martensitic structure. Cu- Ni- Nb steels are heat treated by accelerated cooling and a simple aging treatment at 550 deg C.
Because only about one half the amount of Nb is needed to produce the same strength increase brought about by V additions, Nb steels can have economic advantages in some grades. The most important application for Nb is as an alloying element to strengthen high strength low alloy (HSLA) steels used to build automobiles and high pressure gas transmission pipelines. A number of factors influence the choice of steel composition. In low carbon HSLA steels (C less than 0.1 %), Nb is a more effective strengthening element than V or Ti and most modern HSLA steels fall into this low C category. For achievement of the best results, normally a combined addition of micro alloys is used to exploit synergistic benefits. An example of this is the use of Nb and Ti together in ‘exposed’ IF steel automobile parts where the superior surface quality that results from this combined addition is obviously important. The use of IF steel utilizing Nb and Ti micro alloying has made possible the production of large integrated sheet panels and complex parts, contributing to a reduction in the number of welds, reduction in the number of parts being formed and reduction in weight. Synergy is much more consequential when Nb and Ti are working together than when Nb and V are both present in the steel. Steels for shipbuilding and offshore platforms constitute another important application for Nb micro alloying. In this application, steel plate in excess of 50 mm thickness is common. Long products can be produced in higher strength grades using Nb. Structural sections (e.g. angles, I beams) are widely used in civil construction, railway wagons, transmission towers, etc. Nb has been competing with V in this application. Wire rod is the initial raw material used to produce nuts and bolts, fasteners, springs, etc. Nb has found application, along with V, in some high strength fasteners used in the automobile industry, where the application of micro alloying technology allows the elimination of intermediate processing (spheroidize annealing), quenching and tempering of the final part. Nb, with V, has also become a common addition in spring steels. The higher strength gained from Nb micro alloying allows weight reduction in the finished part. Nb has found some application in high strength and wear resistant rails for railroad tracks operating under high axle loads. Stainless steels, specially the ferritic grades (nickel free) consume about 10 % of the total world consumption of Nb. In Japan, about 25 % of the demand for Nb is in stainless steel. The major application for ferritic grades containing Nb is in exhaust systems of automobiles. Nb is used in heat resistant steels which are used in the petrochemical industry and power plants. High strength Nb micro alloyed grades are used for the production of seamless pipe used in oil and gas well drilling operations (drill pipe and well casing).